For en utrolig flott seng! Ingen grunn til at de små skal ligge i "barnesenger" til konfirmasjonsalderen når man kan finne så flotte "voksensenger". Likte også veldig godt teppet på gulvet. Er selv på evig jakt etter det perfekte teppet til barnerommet. Ikke lett! Lovely! It´s really girly and cozy. And the little corner caddy is super. Such a mix match room - that just creates so mucg interest. Og ha en toppers onsdag! I love the mix of wood in with the white. Such a lovely touch. Nydelig rom, og sengen var en drøm. Kan tenke meg hun vil stortrives her.. I know! We are also renovating. And I don´t see how people manage to do that while having kids. Wish you all the best. It looks great! Lekkert rom og nydelig seng! That is an incredible headboard on that bed. I love the room. Så heldig hun er. Fiiiiiiint. Stunning! I love the eclectic and fun mix of things, and that bed head is beyond gorgeous!! Thanks for sharing. I feel inspired! I've been wondering if the fabric on the wall is Marimeko? in spanish "Alma" means "soul"... so sweety name! The bed head is so unusual, I love the shape of it. I have the same green fabric with the hearts. I made curtains of it for my daughters bedroom. It is a old French Fabric. You can see on my blog ( placed at the month "June" 2010). Greetings and I love your blog. I'm with everyone else... where did that headboard come from!? So lovely I had to blog it! Lovely! Where have you find tHAT beautiful blanket? I feel I´m haunting all the time after perfect blanket. 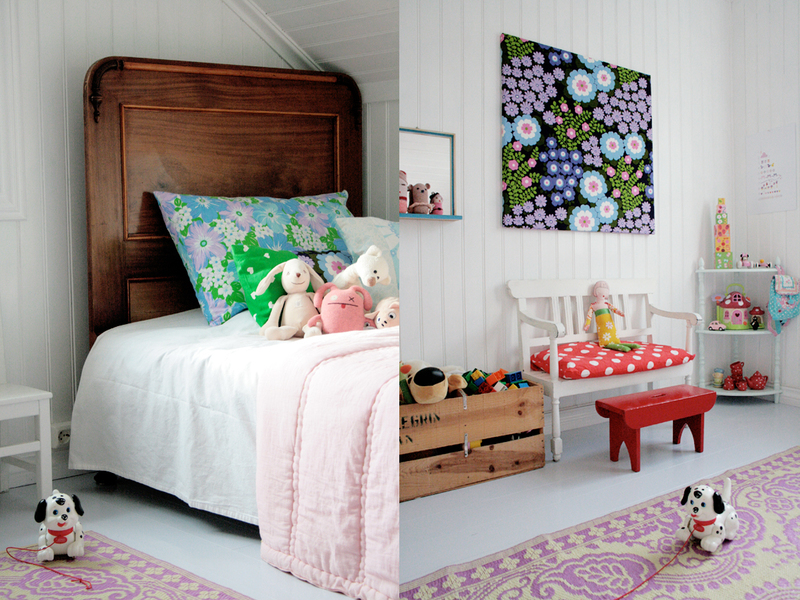 What is the beautiful flower fabric on the wall? I would love to get some!